"The fans are ruthless and don't deserve a winner," Anderson wrote Tuesday in a terse e-mail when asked for a reaction to being released. "I will never forget getting cheered when I was injured. "I know at times I wasn't great. I hope and pray I'm playing when my team comes to town and (we) roll them." Anderson joined the Cardinals, but was quickly benched in favor of Max Hall (this was about six terrible Arizona quarterbacks ago). In 2011 he signed with the Panthers to back up hotshot QB Cam Newton—and reunite with Rob Chudzinski. Anderson never quite got off the bench—his 2011 consisted of just two kneeldowns, and he went 4-for-4 on his only passes of 2012. But he still loves him some Chud. Chudzinski is the Browns' head coach now, and Anderson is inviting himself back to the town he torched. "Looks like it is time to make a return to a familiar place for some unfinished business," Anderson posted on his Facebook page one day after Chudzinski was named Browns coach. "I'd be honored to return to Cleveland to play football if the fans would have me." Ooh. This is going to be awkward. 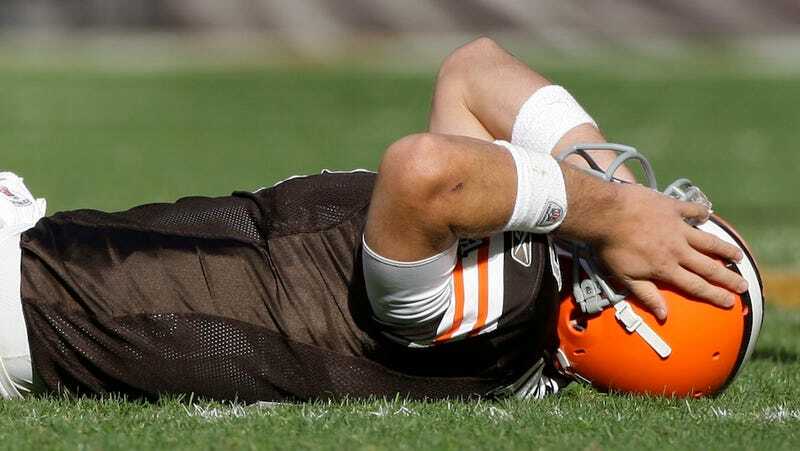 [Anderson] is just four months older than Brandon Weeden, who just completed his rookie season with the Browns.